For those in peril on the sea…. Little did they know that the day would take a dramatic turn with a crew volunteer going overboard and the Watson class lifeboat capsizing in enormous seas. No-one lost their life despite the incident and last weekend the four crew who are still alive today, met for a special reunion at the charity�s RNLI College in Poole, Dorset. The Salcombe RNLI crew were called around lunchtime on 10 April 1983 to assist a group of divers who were reported to be in difficulties � their inflatable dinghy had capsized on the Skerries Bank. As the lifeboat left the harbour it became apparent to the seven lifeboat crew that the conditions were horrendous with ferocious force nine winds and big seas. Among those who put to sea were Frank Smith, now 66 and at the time the Motor Mechanic at Salcombe lifeboat station and crew volunteers Mike Hicks, also 66, and then a local restaurateur, Roger Evans, 70 now and then an Audiologist and David �Whale� Lamble, the youngest crew member at the time aged just 24 and a fisherman. There were four divers in trouble that day. Two managed to get safely ashore in an inflatable dinghy, while the other two were airlifted from the sea by a search and rescue helicopter crew. Following the incident a Framed Letter of Thanks signed by the then RNLI Chairman the Duke of Atholl was awarded to the Coxswain and crew in recognition of their fortitude and determination in the �highest traditions of the Institution�. The Salcombe RNLI team included Coxswain Graham Griffiths, Brian �Horse� Cater, Frank Smith, Stan Turns, Roger Evans, Mike Hicks and David �Whale� Lamble. 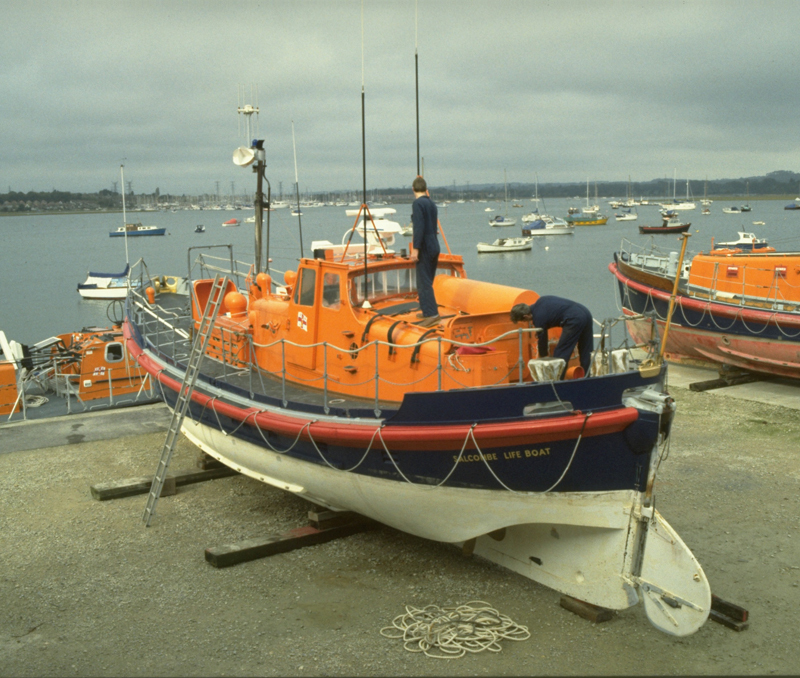 As designed, the emergency air bag fitted to the 47 foot Watson, had inflated as the lifeboat heeled over beyond the point of no return and initiated her righting. The Baltic Exchange suffered minimal damage but was taken off service for a complete survey and refit following the capsize. Frank Smith recalls that when he took her on trials after the overhaul he found signs attached to most bits of equipment reading �this way up�. It is 190 years since Sir William Hillary asked the nation to �lend our utmost aid� to those in trouble at sea. It was an impassioned appeal to the nation, calling for a service dedicated to saving lives at sea, that ultimately led to the formation of the Royal National Lifeboat Institution. What drives postmen, engineers and teachers to put their own lives at risk to save those in peril on the sea? RNLI: What drives these volunteers to put their own lives at risk? An account of the incredible history of Irish lifeboats, and the even more incredible men and women who are respond in the case of disaster. Members of the public may contact the RNLI on 0845 122 6999 or by email. This entry was posted in NEWS, Search & Rescue News, Severe Weather and tagged Brittany, David Lamble, Devon, Dorset, Frank Smith, Mike Hicks, Plymouth, Poole, RNLI, RNLI College, RNLI lifeboats, Roger Evans, Royal National Lifeboat Institution, Salcombe, Salcombe RNLI, Scotland, Sir William Hillary, Skerries Bank, The Baltic Exchange. Bookmark the permalink.